This book takes you through a journey of the ancient patriarchs of the Bible and how they became acquainted with God. The book brings to light probable details of the early characters of the Bible and presents arguments that show the importance man has in God’s plan for the earth that is not immediately evident in today’s perspective of the scriptures. It shows the importance of starting at the beginning of the story about God and his plan for man. This story gives an insight into how God is to bring about the fullness of Jesus as High Priest after the order of Melchizedek. It gives insights into the evidences found in the scriptures of life of Abraham. It details how God called Abraham to service, his relationship with the mystical character of Melchizedek and why God chose him to become the father of the saviour Jesus. It highlights the calling that Adam had and after the fall of Adam and Eve from the full grace of God, how God started the plan of redemption through Abraham and in turn though Jesus Christ. We cover the meaning of Christ for Christians today, and illuminate the role of Melchizedek in the unfolding of God’s plan for mankind. The book describes the characteristics of Melchizedek and his priesthood, and shows this as the glue that makes God’s plan work and the legal basis for God’s intervention into the lives of men and women today. It shows how Jesus was not the ancient Melchizedek, but how Jesus is forever linked to this personality. 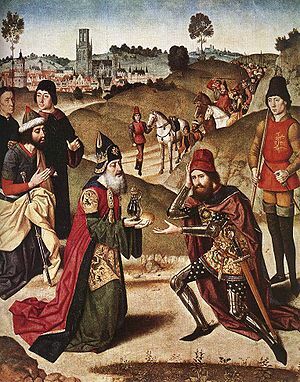 It is a bringing to light of scriptural facts about how Melchizedek determined to meet Abraham and not Abraham seeking out to meet Melchizedek, and a presentation of an argument of why Melchizedek wanted to meet Abraham. The book presents explanations on why Melchizedek was so revered and why Abraham decided to take a tithe of the plunder of the battle that saved Lot and give it to Melchizedek. Through this book I was able to put some of the personalities and characters of the book of Genesis into perspective, and show a realistic time line for some of the period covered by the Book of Genesis. By using the King James Bible and the Strong’s Exhaustive Concordance of the King James Version of the Bible readers can follow most of the explanations in this book. To the enthusiastic Bible scholar the book should be interesting, maybe challenging, but if you are willing to persevere in the reading of this book you will find it enlightening and may even change the way you view the whole concept of faith and belief. For those who have been a Christian for many years, reading this book could be the catalyst to your future success as a Christian. It could change your life and give it meaning and as a child of God giving it direction and a purpose. This book is for all these people and they will all be staggered at what they read. Melchizedek is the key. If we know who Melchizedek is, then the secrets of the Bible start to unravel. I hope you enjoy this book and I hope that it will change your life.